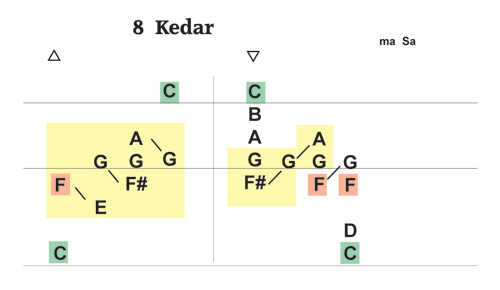 An Image and Muscle Memory approach to, Study and Learning of 101 North Indian Ragas. Although, FluteRaga came into being out of my own practice needs, it is my hope that you may find this approach helpful in your own Bansuri Journey. Namaste ! Daniel. This is a E - Book, in Adobe PDF Format.It will be E-Mailed to you as a Attachment. Once Payment is made, No Refunds, Exchanges etc. Total Pages in FluteRaga. E - Book = 123. 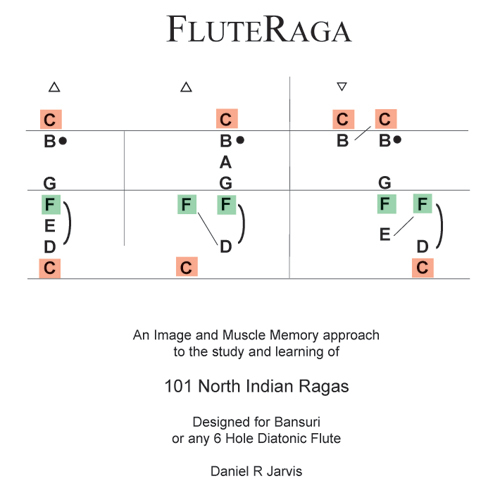 FluteRaga, is a way to study and practice raga in a format designed to be used while the flute is actually being played. 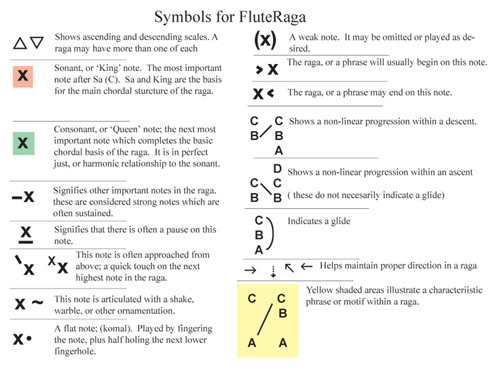 It is a snapshot of a Raga's elements on one page which is seen in a 'flute like' manner, which leads to image/muscle memory as well as conceptual memory. 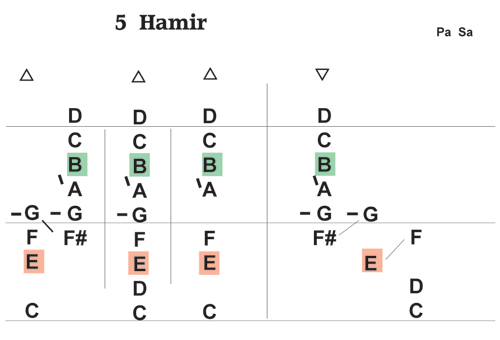 Starting with a basic scale template, notes are added or subtracted for the correct ascent/descent, and symbols are added to represent raga information. These symbols quickly become memorized and are the same for every Raga. See chart below. 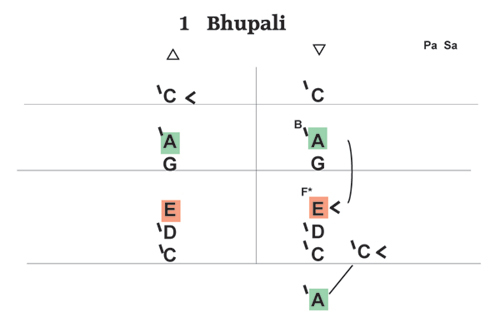 At a glance we see the important elements of Raag Bhupali. The King and Queen notes. Notes approached from the next higher note. Important notes other than K and Q. Characteristic phrases that identify the Raga. 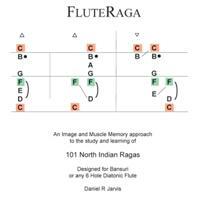 FluteRaga, diagrams 101 Northern Indian ragas organized within the 10 thaat system. An introduction provides a more detail explanation of how the system works and other helpful information. FluteRaga is a PDF file for both Mac and PC. It is designed in landscape orientation to be printed and placed in a three ring binder. The binder can be set up in tipi fashion, and raga information viewed from a distance. Alternately, one can have FluteRaga sitting in the forefront on a laptop computer. This is especially nice when one has tanpura and tabla software running in the background on the same laptop.